“We are at a major movement moment,” says Judith LeBlanc, a member of the Caddo Nation of Oklahoma and director of the Native Organizers Alliance (NOA), which helps indigenous advocacy groups build their organizations and capacity. As LeBlanc watched tribal members from around the country gather near the U.S. Capitol to lead the April 29 People’s Climate March, she credited the past year’s Standing Rock demonstrations against the Dakota Access Pipeline for bringing awareness to indigenous struggles and the continued threats to land and water by a range of industries. “Standing Rock was the largest, longest continuous protest in U.S. history,” says LeBlanc. As a result, she says, a network of tribal leaders and grassroots people and groups have coalesced around the issue of climate justice. “We have the land base, the people, the traditional knowledge and the sovereignty that will ground climate action for the twenty-first century. The power of our beliefs and history can be a guide for all people.” This is already happening, she adds, recalling that Standing Rock was not just about the concerns of that one reservation but about everyone whose water is endangered by building an oil pipeline across the Missouri River. The attention that the Standing Rock actions generated led to two Native groups being included in planning for the 2017 climate march, says LeBlanc—NOA and the Indigenous Environmental Network, which was prominent in the Standing Rock anti-pipeline actions. Eventually, this connection led to the placement of tribal participants at the head of the D.C. procession, where they led the 150,000-person strong march. A similar number of participants took to the streets in marches around the country and the globe. 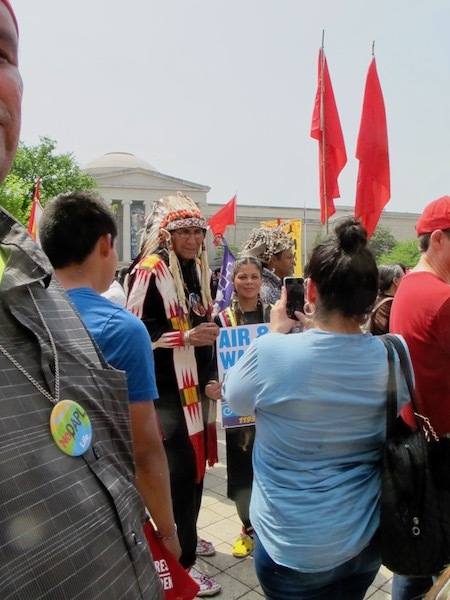 In addition to the larger issues of climate change and climate justice, Sioux people gathered in D.C. had an immediate problem on their minds. 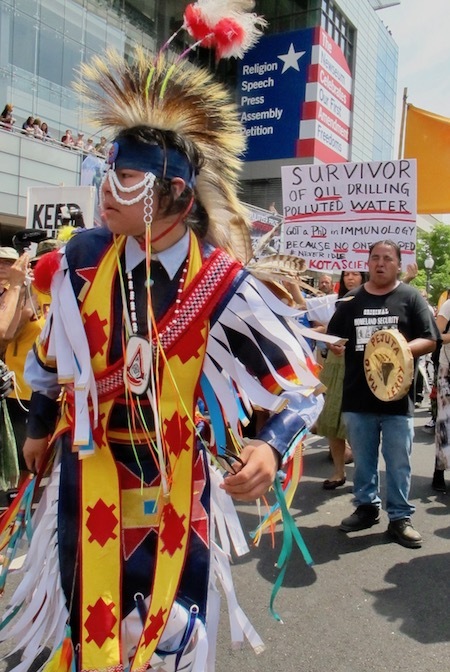 According to Rosebud Sioux leader OJ Semans, an official of the national inter-tribal group, Coalition of Large Tribes, dozens of Sioux were marching to protest efforts to revive the Keystone XL pipeline, which is slated to cross their territory on its way to the U.S. Gulf Coast. The line would transport the dangerous, corrosive tar-sands oil whose extraction has devastated Canadian tribal lands and turned stretches of Canada’s boreal forest into moonscapes of open-pit mines and wastewater lakes. Semans called the pipeline a “zombie”—something the tribes had helped defeat during President Obama’s administration, only to have it rise again, thanks to the new administration and its fondness for industry-friendly executive orders and moribund energy sources. Faith Spotted Eagle, of the Yankton Sioux Tribe, in South Dakota, and Melina Laboucan-Massimo, of the Lubican Cree First Nation, in Alberta, Canada, say their own communities have already begun the transition to green energy. In addition, Spotted Eagle told Rural America In These Times, seven Sioux tribes in South Dakota are collaborating on Oceti Sakowin (Great Sioux Nation) Power Authority. A wind-energy project, it is on track to become one of the country’s largest, with the ability to provide electricity regionally as well as to the member tribes. Way to go Indians! Lead the Revolution! That is Right! Hug those Trees! 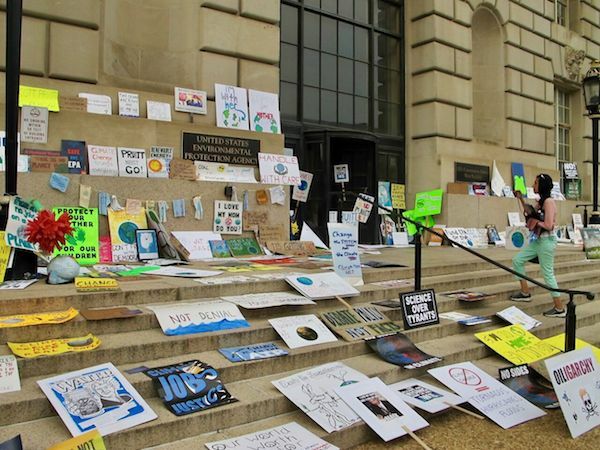 "The Environment must become our Priority."